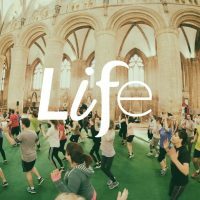 Wild+Fit has been a fantastic fitness and wellbeing event in Gloucester Cathedral, introducing people to holistic and fun exercises, as well as raising funds for Gloucester City Mission. The Cathedral Nave was taken over by people learning different fitness exercises together, having fun for this one-off event. We all shared sacred space and common ground – exactly what a Nave is all about! Combining sports with belief (as with the recent Football tournament), people from lots of different backgrounds and communities came together to explore faith and what it means to ‘live your best life’. Sports Ministry is a core part of our Life vision, and if you would like help, resources or advice on running your own Sports Ministry events – please get in touch via the Sports Ministry page.